New paint turns these Royal Enfield Meteor parts into sculpture. 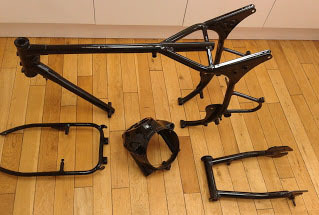 "Meteor Man" Thomas Russell is back with his latest post on his cleverly named blog, 1959 Royal Enfield Meteor Minor Overhaul. Tom is the young man in the UK who was gifted with a very needy Royal Enfield Meteor in 2011, just as he was about to be presented with his first-born child. Mother and baby are doing fine; father and motorcycle a bit less so. Balancing baby and motorcycle proved a challenge and his delightfully wayward efforts to give the Meteor new life have proceeded in fits and starts. Tom's latest progress has been propelled by bad luck with parking lot mishaps to the car his wife drives (it used to be the car Tom drove, he notes). What better way to find a body and paint man to respray the Meteor frame? Tom's best asset has been his sense of humor. Anyone who has come up against the problems posed by restoring a motor vehicle will enjoy reading about his experience.